Canberra goes to the polls in a few weeks time to elect a local government. If reelected, the governing Labor Party has promised a tablet computer for each of 6,000 Canberra high school students, at a cost of AU $17.2 M, over four years. There are better alternatives. The tablet proposal works out to about AU $2,800 per student, which appears expensive. There are now folding touchscreen laptops about the size of an A4 pad, for under $500. These are suitable for older students. However, is issuing standard devices to students educationally useful? There was a previous Australian national program to provide a computer for every high school student and have been laptop and tablet programs for students in other countries. The best known of these programs was the One Laptop Per Child Project (OLPC). Such programs have not been shown to significantly benefit education and may have done some harm, by diverting resources from other educational initiatives. An alternative strategy for Canberra would be to ensure that educational resources are available on the range of devices students have at home and school. A small fund could provide for disadvantaged students who cannot afford a $500 device. More could could then be spent on training teachers for the Australian Digital Technologies Curriculum, using the CSER Digital Technologies Courses and the Inspire Center. Funds could also be used to allow some of Canberra's teachers to work on new materials for both Technologies curricular, for senior students. Last Friday, I attended a meeting in Canberra discussing how new features in Moodle and Mahara might be used for assessing the competencies of university students. As discussed in the previous post, Mahara SmartEvidence seems to be more suited to the reflective development of higher-order skills, while Moodle Competencies may be useful for low level skills. Competencies were introduced in Moodle Version 3.1, 23 May 2016. As with Mahara SmartEvidence, Moodle Competencies allows a "framework" to be used to manage the assessment of a student against a large number of "competencies". As with Mahara only administrators can set up the frameworks in Moodle, not teachers. Unlike Mahara, Moodle has the concept of a "Learning plan", which can be designed and then applied to one student or a group of students. Teachers can also add competencies to whole and activities within courses activities. What is unclear to me, at this stage, is the relationship between competences, learning plans, courses and frameworks. In particular what is a "learning plan": is it a collection, or sequence, of tasks with associated competencies? Is this the VET equivalent of a course? Moodle is a course orientated system, but competencies will typically be at a finer level of detail, with perhaps six to twenty-four competencies per course (and hundreds for a program). Also students may only need a few of the competences from each course. One interesting point is that students can also (if authorized) add evidence of prior learning, to provide evidence of competency. This practice is common in the Australian VET sector called "Recognition of Prior Learning" (RPL), but has not been so popular at universities. However, with the demand for university graduates to have more vocationally relevant skills, RPL is finding favor. 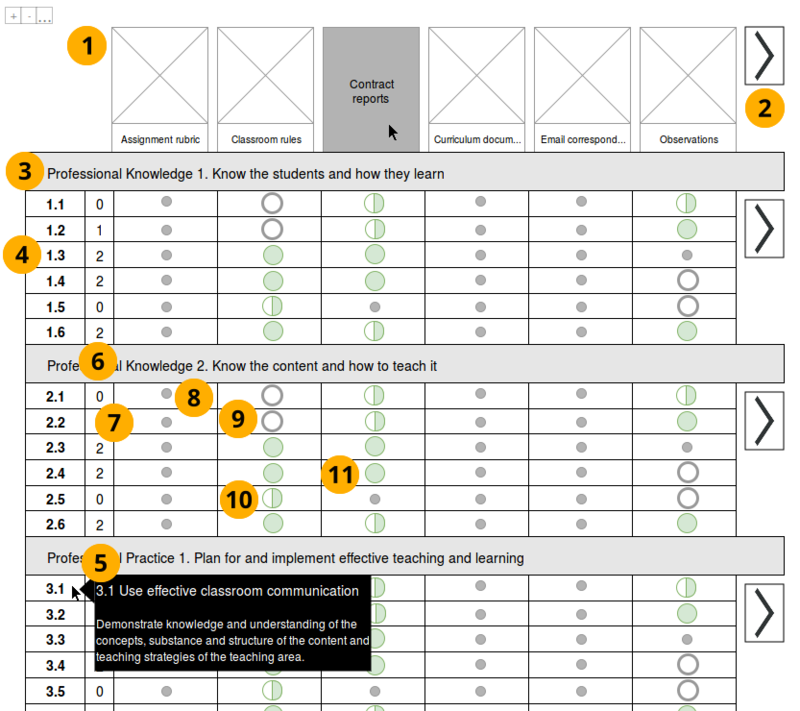 The competency tool might be used for Work Integrated Learning (WIL), where the student receives credit for practical work during their studies. However, with RPL and WIL, there is the problem of how this is assessed and verified. It is hard enough checking that a student really did a task at the institution, let alone one undertaken elsewhere. There is provision in Moodle for manually assessing competencies, which is similar to the process for process in Mahara SmartEvidence. One difference is that students in Moodle can be rated on a scale (so they are more than competent), rather than just partly or completely competent in Mahara. In Mahara all the competencies are manually assessed: that is an assessor looks at the evidence the student provided on a page and decides if this partly or fully meets the requirement. In contrast, the emphasis in Moodle is on automated assessment of the competency. Typically, the student will be considered competent when they gain a specific grade in a quiz or some other form of assessment. This follows the practice used by VET, where students do many small tests. Last week I attended a meeting in Canberra discussing how new features in Moodle and Mahara might be used for assessing the competencies of university students. 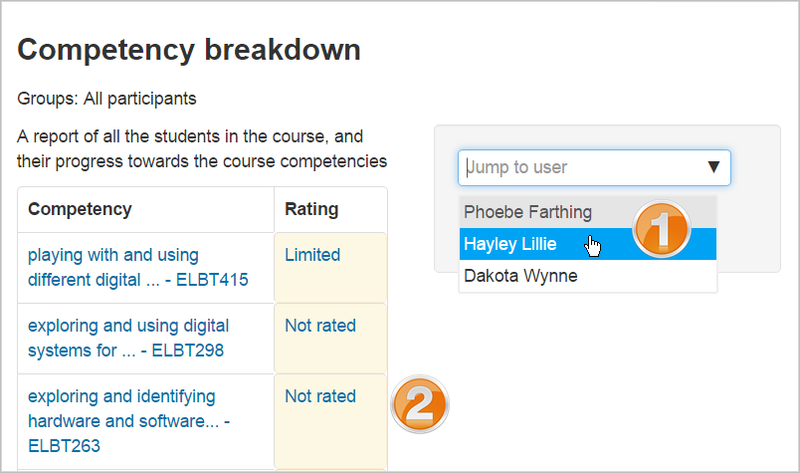 Mahara is introducing SmartEvidence later in the year and Moodle already has "Competencies". Mahara SmartEvidence seems to be more suited to the reflective development of higher-order skills, while Moodle Competencies may be useful for low level skills. SmartEvidence might be used across a program), while Competencies would be used within courses). SmartEvidence is being introduced in Mahara version 16.10 (due for release 31 October 2016). There is a brief overview of Mahara SmartEvidence in the manual and detailed technical specification. The tool is intended to allow a "competency framework" with prescribed "competencies" (also called "skills" or "attributes") to be defined. A student can then nominate which pages in their e-portfolio they believe provides evidence of the competences. An assessor can then record if the evidence partly or fully meets the requirements. Without SmartEvidence a student can use Mahara to present their e-portfolio, but they and the assessor then has to manually tabulate the competencies. SmartEvidence emulates the paper based process traditionally used for competency based evaluation. Competencies can be grouped into clusters of competences to make it easier to deal with a large assessment process. As an example, Athabasca University's MEd has six clusters, with a total of 47 competencies (Hoven, 2015). SmartEvidence may not provide all the features needed to replace the on-line processes now used with Mahara and Moodle. As an example, SmartEvidence allows a student to nominate a page to support multiple competences. However, there is no way to point to a specific part of the page and the assessor is left to manually look though material seeing what may match. SmartEvidence appears to have no provision for multiple levels of assessment. In particular there is no provision for peer review of e-portfolios by other students, which I have found to be a very useful part of a program Capstone (both as a reviewer and someone being reviewed). In addition the competency frameworks for SmartEvidence are assumed to be centrally managed and fixed. The assessor cannot make up their own framework and cannot modify a provided framework. This makes sense where there is a centralized approach used, with a division between assessment designers and implementors, however, it limits flexibility. Richard Hill and Kristen Lyons wrote, "Academics are unhappy – it’s time to transform our troubled university system" (The Conversation, September 20, 2016 ). However, I suggest instead, it is time to transform our academics into independent, professional educators and impresarios. Australian academics will be happy, when they skill-up to face the challenges of 21st century education. Universities need a mix of full-time academics, plus part-time professionals with current real-world experience. Casual teaching is set to continue and academics need to learn how to work in this global on-line education environment. School and VET teachers are required to have formal education to help them cope with student demands, teaching and administrative workloads. In contrast, university academics suffer frustration in the workplace, because they are not trained teachers. Higher-degree graduates are disappointed when they find that there are few long term and permanent positions for them. The solution to this is to change the selection, training and therefore the expectations of HD students. It should be made clear to those applying to undertake post-graduate studies that this is not a ticket to a university appointment, more like a lottery. The training for graduates needs to emphasize coursework and vocational training for jobs in industry. Those aiming for the small number of jobs in academia will require formal training in how to teach and administer, as that is what they will be spending more than half their time doing. Researchers spend much of their time applying for grants to obtain funding, so training in business skills will also be required. This training is much the same as that provided for budding entrepreneurs. Australian universities are currently experience a boom, with international students providing funds to subsidize research. Just as the mining boom ended with a sudden crash, it is likely that this education boom will end suddenly, in the next five to ten years. The nations which Australia provides education services for are building their own higher education industries. Not only will these countries have less need to send students to Australia, they will be able to offer low cost education to Australian students. Australia domestic car industry was protected for decades behind a tariff barrier, but collapsed when that barrier was removed. In a similar way Australia's education industry is protected behind a barrier which will disappear in the next five to ten years. The Australian eduction industry will collapse, if it does not prepare now for increased global competition. Australian governments will find it increasingly difficult to provide subsidies to the local education industry. International trade agreements have exemptions from free trade for education. However, as countries see they can compete in this industry, there will be pressure to remove these barriers. Even now, an international for-profit university can set up a campus in Australia and receive Australian government education funding. Multi-national universities do not need to employ more than a handful of staff in Australia to qualify as an "Australian" university, with the bulk of the teaching and administration done on-line, offshore. Australian students will find the option of studying on-line with an overseas university increasingly attractive. Australian academics need to gain the skills necessary to compete in this international environment, providing reasonably priced education, which is both academically sound and vocationally relevant. The "Digital Indonesia" conference concluded today at the Australian National University in Canberra. The standout presentation today was Nava Nuraniyah from the Institute for Policy Analysis of Conflict on "Online extremism: the advent of private chat groups and its policy implications". Terrorism is a serious business, but those frequenting extremist chat groups also share interests with the rest of us, including gossip, recipes and shopping. Greetings from the Australian National University in Canberra, where the Vice Chancellor opened the "Digital Indonesia" conference (being live streamed). The first presentation by Eve Warburton (ANU) is giving a detailed forensic analysis of corruption and incompetence of Indonesia's politicians. It will be interesting to see how the Indonesian delegates react to this. Bates (2015, Chapter 6) uses a rock concert as an example of an event were everyone is at the same place. However electronic audio amplification is used for rock concerts, along with large video screens. Without this electronic assistance it is unlikely the performers could be heard or seen by most of the audience at a rock concert. The sense of all being in the one place is an illusion created by the technology used. We can use this illusion in education. One example demonstrating the use of technology intermediating to create multiple places is a "silent disco": several channels of music are broadcast simultaneously and each patron chooses which to listen to on their headphones. The silent disco technique is used in the X-lab at the Charles Perkins Centre, University of Sydney. Directional loudspeakers deliver audio to selected parts of the lab, while video is directed to the student's workstations, allowing up to four classes simultaneously in one room of 240 students. A lower cost alternative for a "silent lab" would be to have students use their mobile device to receive video and listen through a headphones, using the same webinar software as for remote access. There would be no need for any specific technology in the room used and others could remain undisturbed by the students and instructors. Classes could be held in very noisy places, without the students in a class disturbing, or being disturbed by, those not in the class. I will be giving a short talk on "Digital Service Standard for eLearning" at the Canberra User Experience Meetup on Thursday, September 15, 2016. Also speaking are Ross Stephan on "Usability of the Employment Services System, Ingrid Kimber on "Safe Work Australia Website Redesign Project", and Emma Walker on "Industry exemplar from the first wave".